Stop running up and down the stairs! End the yelling to “pick up the phone” or “come to dinner” with Hands- Free Reply! Call from the main unit to all the other room units and your family members can reply without even pressing a button. Monitor your loved ones. Never be more than a few steps away from easily monitoring a child or family member. Have peace of mind as you move from room to room monitoring at every speaker location in the home. NO static filled receivers to carry! NO batteries to replace! See and talk to visitors at your door without leaving what you are doing. Know who is at your door before you answer it. Safely screen visitors from any speaker location. Optional high-resolution cameras and cutting edge LDC screens can allow you to see your visitors as well as talk to them, making your home even more secure. Do all of this and more with On-Q’s CAT5 based, Decora styled communication system! 1 Antique Brass Push-Button Door Speaker with Chimes. units or 11 room units and 3 door units. Face plates are standard decora style. Control buttons are oversized and backlit for ease of use. You may monitor or listen in to a specific room. LED’s on the Main Console show the status of all rooms on the system; monitored, muted or in-use. You can talk to the door speaker(s) from any station in the house. Adds one (1) additional 7596AB Door Speaker with Pushbutton as shown above. Adds coverage for one (1) additional room or area of your home. This speaker has all the same features and options as an interior room unit shown above, but is weatherproof for exterior use. Intercom Systems#7637, but offers added convenience. Without leaving your desk you can communicate with the front door speaker or any other unit in the system. Place it on your night stand and you can listen for a baby or other family member that may need your assistance. Unit is black with a black cord. Now you can be two places at the same time! By adding the FamilyIntercom Systems Pack Camera System to your intercom system you can see as well as talk to areas throughout your home. Using the latest CAT5 technology you can choose where you need to “see.” One camera is permanently mounted at your front door, while the other camera is portable and can be moved between three different locations you specify in your home. Choose between the baby’s room, the playroom the rec room, mom’s room or any other three rooms in the house that contain a structured wiring multimedia outlet. Just plug the Intercom Systemsportable camera into the designated jack and the room is instantly viewable on any of the system’s LCD screens. The System will accommodate up to 4 cameras and 4 LCD screens. When there are more than two cameras in the system, cameras # 2, 3 & 4 will sequence on the LCD screen at a designated rate. Adds One (1) # 2284 B & W Camera to the Family Pack Camera System. Specify Fixed or Portable Model. Adds One (1) # 2299 Color Camera to the Family Pack Camera System. Specify Fixed or Portable Model. Color cameras are only recommended for use in illuminated areas. They require more light than the B&W cameras in order to produce an acceptable picture. Replaces One (1) # 2284 Black & White Camera that comes with the Family Pack Camera System with One (1) #2299 Color Camera. Specify Fixed or Portable camera upgrade. Adds One (1) additional # 7599WH LCD screen with White Frame to the Family Pack Camera System. 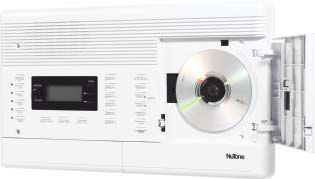 A NuTone Radio Intercom system plays your favorite radio station throughout the house while the CD system can also add crisp, clean music of your choice on demand to any room. You can even attach your personal audio equipment to a NuTone Radio or CD Intercom to increase your choices. You’ll be amazed by the superb sound quality produced by these systems. 1 Push-Button Door Speaker with Chimes. listen in to a specific room. Digitally tuned radio with timer allows you to wake to music. LCD Display and twelve (12) station radio memory. Backup battery runs for up to thirty hours to save settings should you loose power. 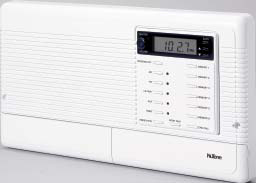 American Home Systems will install the radio antenna as supplied by NuTone with each NuTone Intercom System but, because of uncontrollable factors such as home location, power lines, local airport electronics, etc., cannot be responsible whatsoever for the quality of the AM or FM radio reception experienced through the intercom system. Radio reception is a secondary function of the system. 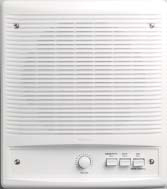 If listening to AM or FM radio through your intercom speakers is an important factor in deciding to install this option, consider adding Option # 05-020-IA30 “Audio Equipment Adapter” shown on the next page in order to utilize the “line out” capability of a higher quality stereo receiver as your radio source as well as being able to utilize other stereo equipment such as a multi-disk CD changer. 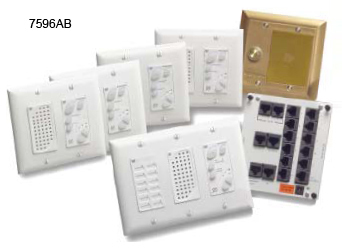 Another alternative to consider for music distribution is installing a “Voice Only” intercom system, as shown previously, and installing a whole house audio distribution system as shown in this catalog. and Enjoy the Benefits of Whole House Music! While providing monaural sound, the NuTone intercom system, with 8”Intercom Systems interior speakers, is an excellent and economical choice when you want both communication and background music throughout your home. Coupled with the Audio Equipment Adapter, the NuTone intercom system with 8” speakers becomes a veritable whole house music system, allowing you to enjoy all of your own audio equipment, in addition to the intercom system, wherever there is an intercom speaker. Intercom SystemsAllows the homeowner to attach up to two other pieces of audio equipment they own to a NuTone Monaural Intercom System by using 2 RCA input plugs which are connected to two inputs on the back of the Intercom Master Unit. Not available with Voice Only System.